Huh? Well, I guess there comes a time in a cat’s life when he wants to know where he comes from…what makes him who he is. Not just his personality, but what makes up his core – his DNA. Well, Harley is in luck! 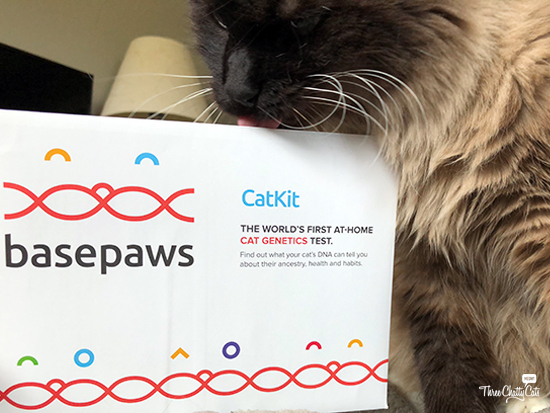 Enter Basepaws, the company behind the CatKit, which is a DNA test for cats! Regular readers of the blog know that Harley is our newest addition at the Three Chatty Cats household. Both he and Woodrow (our two foster fails) have taken on the Jr. Associates title. While our other cats easily fall into the “domestic shorthaired” category, Harley appears to be more of an identifiable breed. On his adoption paperwork, it stated he may be a Himalayan mix. But our vet thought more like Siamese. That’s one of the reasons why it will be so interesting to see the results from the Basepaws CatKit! 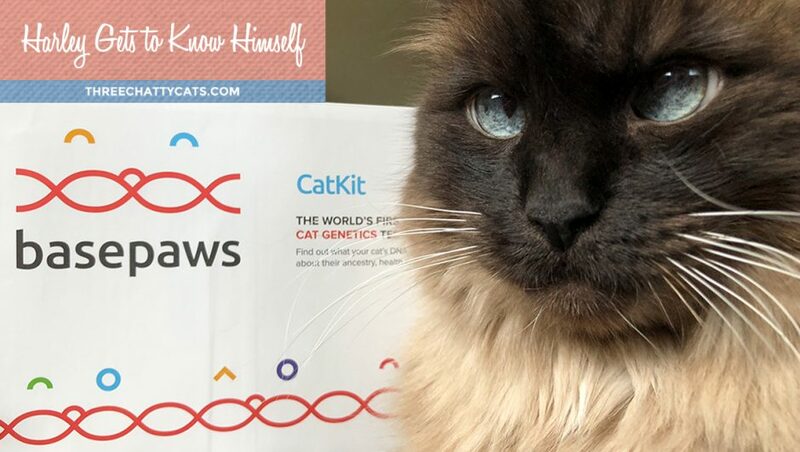 Not only will the CatKit tell us about Harley’s ancestry and breed determination, but we’ll also find out how his genetics may influence any health risks and conditions. 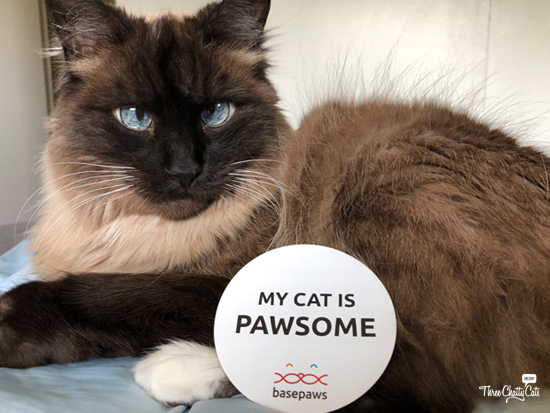 Basepaws uses hair to test the DNA, and collecting the sample is done in the comfort of your own home. Basepaws sends the CatKit in the mail, and then you go about collecting the hair samples. It’s quite simple. You place a strip of tape (provided in the CatKit) on your cat’s back and gently peel it off. You do this twice and then mail back both strips of tape. Pretty simple! Harley’s collected hair is on the left. Don’t worry, cats have so much fur that you can’t even tell any is missing. The collection process took less than one minute. I will say that with Harley, it was a two-person operation. So, I don’t have any photos of collecting the hair. However, you can watch this Basepaws video to see how it’s done. You can be sure we’ll let readers know what Harley’s test results show! Basepaws has been kind enough to offer our readers a discount code! Regularly $95.00, our discount code allows readers to purchase the CatKit for $75.00 (USD). Order Now: Buy the CatKit! 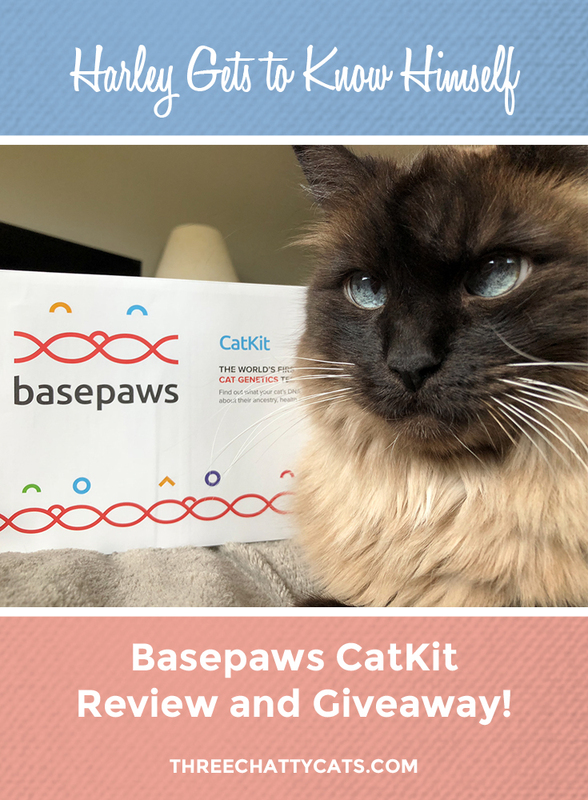 Basepaws is also letting us give away one CatKit to one lucky reader! Simply enter a blog comment below and then enter the giveaway. The giveaway is open to U.S. residents who reside in the 48 contiguous states, 18+ years of age, except where prohibited by law. One winner will be selected randomly by Rafflecopter and contacted via email. Each winner will have 48 hours to claim their prize. Failure to do so will result in forfeiture of the prize, and a new winner will be randomly selected by Rafflecopter. The giveaway closes on Sunday, September 9, 2018 at 5pm Pacific. Stay tuned for Harley’s test results! 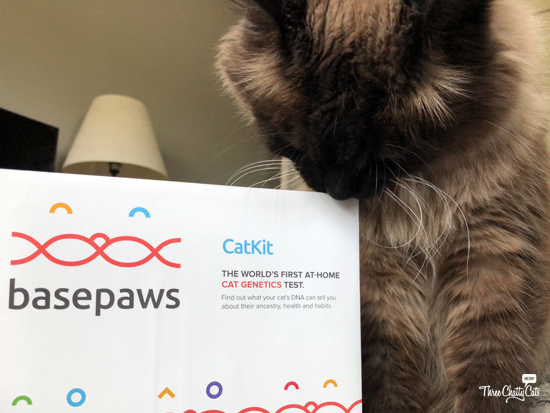 And…we just may be giving away another Basepaws CatKit to a reader later in the year. Be sure you’re signed up for our newsletter so you don’t miss out! Next Chatty Cats: Piggies, Disappointment and More! I wonder if you will find out if he is related to any king and queen cats from the past! Interesting! One of my foster friends has a foster kitten who is super lean and leggy (so much so the foster was worried for weeks that she was too skinny). She looks like a tabby but the vet (who pronounced her perfectly healthy, just lean) thought she might have Siamese in her!! Would be interesting to find out. I want to know what breed my tortoiseshell cat is. Harley has the same eyes as my Siamese mix Toonces. She had short hair but the same blue slightly crossed eyes. Can’t wait to read Harley’s results. I’m pretty sure Rosie and Teddy (foster kitty) are basic DSH, but it would still be interesting to know for sure. Ruby is more of the wildcard – who the heck knows what breeds she is. It will be interesting to read about your results. I hope it’s nothing but great news on the health front! Cool beans! This is so much fun! And Harley, you are loved and beloved, so don’t worry about your genetics! Sounds very interesting! Can’t wait to hear results. Oh wow Harley how exciting, we can’t wait to hear the results dude! Wow….wonder who Harley is related too. Perhaps an ancient god in Egypt. Maybe his relative is buried with royalty in the Vallley of the Kings in Egypt. How exciting. Can’t wait to see what make you you, handsome boy!! How fun! I won’t sample my own DNA for a variety of reasons (no control of my DNA after that; some db shown to have references as small as 100 samples) but wouldn’t mind finding out about my cats. I look forward to reading about Harley’s results and any updates! It will be interesting to know what Harley’s DNA will tell you. Hope you have a faster turn around than Johnny at Pets Overload did. Maybe they are starting to get it together. TW is hoping to find out how much blood I can get out of her if she tries to stick something on my back. Can’t we use the fur that’s collected when I get FURminated? They need the hair follicle, so it’s best pulled out on tape I guess. 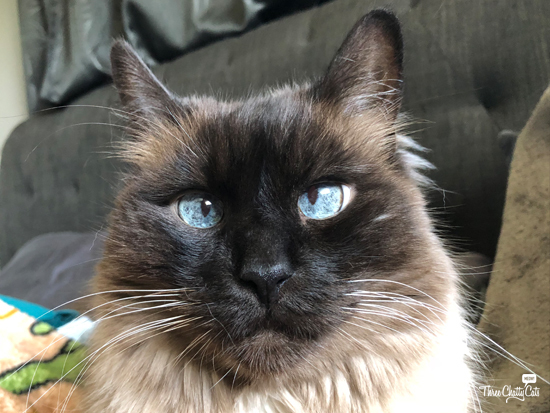 BTW, my guess is Harley is a Birman with those blue eyes. Ooo, I could see that! I will bet there is some Royal in there somewhere! We can’t wait to find out the results from Harley’s test. we sent ours in ages ago and still have not heard anything.. I should look into that again..
We’re so excited to see what you find out, Harley! I’m really excited to know his ancestry, can’t wait to hear the results. We are eagerly awaiting Millie’s results, it has been a few months. I would like to find out the true breed and kind of cat Daisy Mae is. Another site did a giveaway of basepaw kits and I read all them and my conclusion is that basepaws sounds like a scam to me but make your own conclusion. Don’t expect to much. I do hope I win this giveaway. Please enter me. I’ve been very interested to get information about Rousey’s background. I’m sure its something exotic! Will eagerly await your results! It’s always nice to have a personal recommendation. But do hope we win! Wow 2 to 6 months does seem like an awfully long time, but this is cool! We’d love to try this! My cats aren’t identifiable breeds either. I would be interested in seeing if my cat has any Mainecoon in her because I think she does, although she is definitely not purebred and she has a lot of domestic in her too. He’s totally gorgeous. I’m betting on Siamese because of his beautiful blue eyes. The giveaway is now closed. Winner announced soon!